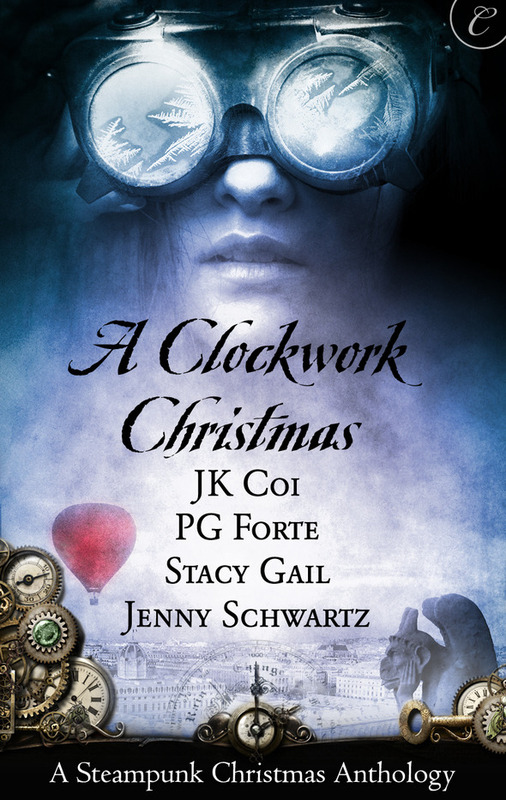 A Clockwork Christmas edited by Angela James (Carina Press, December 5, 2011) featuring novellas by J. K. Coi, P. G. Forte, Stacy Gail and Jenny Schwartz. I think I’ve made it pretty clear that I love steampunk romance. Whether I’m raving about how Meljean Brook is the best introduction to steampunk or qvelling over the gaslight overtones of Cindy Spencer Pape, corsets, clockworks and romance float my boat. But finding other great steampunk or gaslight authors is challenging (there are a lot of writers who sound like they should still be on a fan fiction site honing their skills a little longer before finding a publisher), and anthologies are one of the best ways to taste the flavor of a new author without committing to a longer book to see if they pull off the genre. I’m pleased to say that Carina Press editor Angela James has worked her usual (gaslight?) magic to find a roster of authors up to the task in A Clockwork Christmas. Selecting these four stories because of how they work together, James nevertheless indicated that she was overwhelmed by how many excellent steampunk stories she received after Carina expressed an interest in the genre. Many of them were independently published by the ebook publishing house this past year and seem to be of novella length for the most part. As with other anthologies I’ve read from Carina, you can buy this compilation as either the anthology (linked above to title) or as individual ebooks (linked below in the title of each individual story). I fell for Stacy Gail’s writing the other week when I drooled all over her science fiction novella How the Glitch Saved Christmas. She keeps up her writing streak of awesomeness with this story, set in a nineteenth century Boston rife with clockworks. Cornelia Peabody is a loner and thief, but she’s content with her life of relative success. The fact that she limits herself to stealing from companies or organizations rather than individuals gives her some peace at night. As she walks through Beacon Hill days before Christmas, she realizes her home has been broken into as one of her careful alarms has been tripped. Being a thief herself, she’s not about to call the police, but she carefully uses her surveillance equipment inside the foyer to see if anything looks amiss. Deciding it doesn’t look dangerous, she still takes precautions to check on her office – where she is pounced upon by a large man in black who knows her name and her crimes. He obviously hates her, but she doesn’t know why. 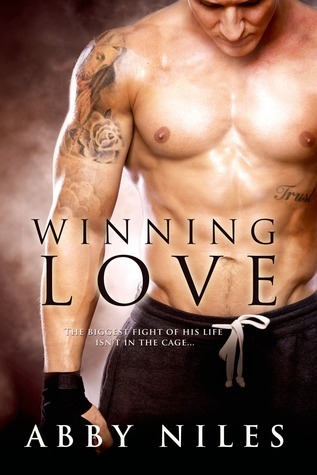 Professor Roderick Coddington is elated he finally has the monster responsible for murdering his sister in his grasp…and he’s angry that she’s so beautiful and that his body clearly wants her. Ignoring its demands, he slaps a special clockwork bracelet on her that she cannot remove and then takes her to his workshop to see exactly what it can do. An electrocution device, the bracelet is set on countdown for seven days; either Cornelia Peabody steals back the Faberge egg that she took from Roderick’s sister, the loss of which sped her demise, or she dies a horrible death in one week. It’s not much a of choice, so Cornelia does it, trying to deny to herself that it hurts to be hated by this man who doesn’t even know her. The more time they spend together, the more their illusions shatter. Roderick is capable of emotions other than anger (quite compelling ones) and Cornelia has a strong sense of honor despite being a thief. Her intellect and ability amaze him and once he sees the scars that cover her body from the nightmare childhood that led her to her profession, he begins to realize that nothing is as simple as he would like to make it. The final job of stealing back the egg causes them both to confront the past, leaving the reader to wonder if their choices will be different, at least different enough to allow for a future between these two lovers. Smoking hot love scenes and the ability to capture powerful emotions make Stacy Gail’s story a standout. As in her science fiction story, she has the ability to layer the world-details, many of which are highly technical, in such a smooth fashion that you don’t realize the amount of information you are swallowing, you just know that the rich details of the place and time period are truly alive. As with any couple in an extraordinary situation, Cornelia and Roderick’s descent into lust and then love, is so believably written that your feelings transmute along with theirs, until you are pulling so hard for them to work through their issues that you cheer at the ending! Ophelia Winter has been left destitute by her father’s death. With the war between the states ended and the Confederacy triumphant, his inventions, which could have helped the Union cause, were left unfunded. The person who refused to fund them was none other than Ophelia’s husband, Dario Leonides, due to the fact that her father chose to reveal that Ophelia was one of those inventions – a sophisticated automaton whose blood and flesh were formed from the raw material from her father and his dead mistress. As neither Ophelia or Professor Winter ever revealed her nature, Dario felt betrayed by them both, determining that as a machine, Ophelia was incapable of returning the love he felt for her. Ophelia was and is totally in love with Dario, and understands why he felt betrayed but it was no excuse to throw back the dedication and love she felt for him when he asked her to leave his home and his life. Seven years later, she’s back in Santa Fe and needing Dario’s help. She has to find a way to support herself and her son with Dario, a son he doesn’t know exists. Naturally Dario is stunned and disbelieving at the thought that Ophelia had his child. Her father was very clear that he felt she couldn’t have children. But the boy Arthur resembles them both with winning ways that begin to open Dario’s very closed heart. Even while his body wants Lia, he tells himself and her she has no soul and is just a “thing,” a cruelty that Ophelia cannot overlook. When the tension between them comes to a head, the situation endangers Arthur, and Ophelia reacts with the maternal instinct to save her child, a reaction that could cost the family their only chance at finding happiness. I’m not a fan of second chance romance, particularly not when one of the couple acts like a jerk, and Dario fits this bill. It’s a credit to author Forte that she makes very clear Dario’s mental block – he was so appalled at being lied to by two people who he trusted and loved that he just shut off the part of him that loved Lia. Using his religious background to excuse his behavior (a “thing” cannot feel pain or love), he also uses it to explain why he hasn’t divorced her all these years. Most importantly, he has no excuse for his reluctance to divulge her secret, other than his long-denied feelings for her. They both know she would be captured and experimented upon if anyone found out what she is, and Ophelia clings to this one gesture of compassion. But it’s hard to fall for a hero who acts like an utter prick for two-thirds of the story, even when you know his motivation. While the cataclysmic event that almost takes Arthur and Lia from him turns Dario around and he works to help her realize he’s changed, I’m not sure it’s enough for me (although it’s beautifully written). Forte’s writing is truly excellent, so I think this is really my problem with not being able to forgive a hero/heroine who acts so abominably toward another human being. 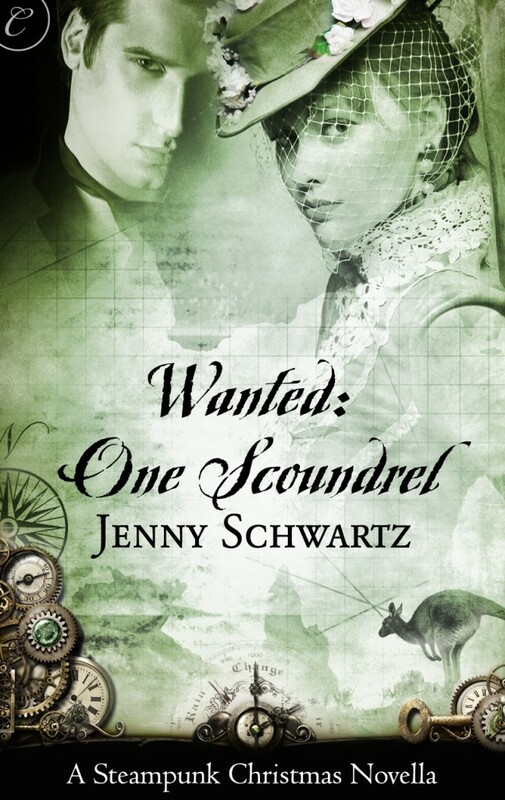 This was an extremely sweet story (the hero and heroine don’t even kiss in this novella, it’s so in keeping with its time period) set in a rapidly growing steampunk Australia in 1895. Esme Smith is the daughter of a successful inventor who has raised her to be independent and determined in all her endeavors. Right now, she needs a scoundrel, a charming, good-looking man she can hire to inflitrate the exclusive mens’ clubs where politics are discussed. You see, Esme is a suffragette looking to lobby for the vote for women in her young country. Luckily, her uncle, a captain, has just docked and says he has a likely candidate for her on board. Jedediah Reeve takes one look at the golden-haired beauty in the Captain’s cabin and is more than happy to do anything she wants. He’s even more impressed when she outlines her political machinations; not only does he agree with her, but he also can see her motivation comes from her own sincerity and belief in her cause rather than a bid for personal power. Laughing inside at the thought of being taken for a scoundrel when his family thinks he’s the most boring one of the bunch, he shakes her hand and looks forward to spending more time with her as she coaches him in key talking points. But Esme has a nemesis in the form of one Nicholas Bambury the Third (what a perfectly pompous name!) who not only wants to use his good looks to court Esme but happens to spout the opposite political agenda at these mens’ clubs where Esme can’t enter. Jed hates him on sight, an instinct only amplified as Bambury’s suit for Esme’s hand becomes apparent, and when Bambury attempts to bully Esme into marrying him, Jed is ready to defend her honor. Esme is a caring, managing female who has met her match in Jed. Rather than a typical alpha male, Jed revels in Esme’s personality and assists her while making it clear he’s doing what he wants rather than having her direct his every move. Schwartz has a rather expository writing style, with characters filling in a certain amount of backstory. Her strength is the ability to evoke a strong sense of place, with her description playing on all the senses until you can literally see and smell Australia in front of you. The steampunk aspect is natural and unforced and Jed’s real profession of invention offers a conduit to explaining the clockworks and machinery he encounters. My personal taste is for a lot more sexual heat, but this is a lovely story in a setting I truly enjoyed. I was trepidatious about tackling yet another second chance romance when they are not my preference, but I was pleasantly surprised to find J. K. Coi’s writing so compelling that I was immediately sucked into this story. Lord Jasper Carlisle (Colonel Carlisle) has had his secret life as a spy come crashing around him. Upon returning home after a disastrous mission, he discovers that his young, vivacious wife, the prima ballerina Calliandra, has been kidnapped from their home. With the help of a few loyal servants and friends, he finds her, horribly tortured and barely alive in a nearby hunting cabin. Having known the military has advanced technology that can help repair massive injuries, Jasper takes Callie to them, agreeing to any price to save her. When her excruciating screams indicate that his presence is not helping, he leaves to track down the three men responsible for torturing her, ensuring their demise is just as painful as what they did to his beloved wife. Callie is horrified to awaken and see heavy iron limbs with clockwork mechanisms in place of the feet and legs she has danced on all her life. Her iron hand and gunmetal gray eye also appear alien despite the realization that they work better than their predecessors. Sitting more heavily on her spirit than her heinous modifications is the fact that her torture and resurrection are a result of the lies her husband told her – she never knew he was a spy working for the military. When he returns to face her, accepting the blame for her misfortune completely and allowing her to heap the guilt of their situation upon his shoulders, she finds herself confused. Jasper is behaving like he is still in love with her, despite her transmutation into a dark creature when compared to the sunny woman she used to be. Determined to show Callie that he is still profoundly in love with her, perhaps more so as her strength and inner beauty has become more visible, Jasper is determined to prove himself and let her decide what’s next for their relationship. But his courting of his own wife takes a sudden turn upon an attempt on their life, a bid for assassination which reveals a much more sinister twist in the circumstances of Lord and Lady Carlisle. WOW. I’m overjoyed to realize that this is actually the first of a series (Seasons of Invention) starring Jasper and Callie because there is no way just one novella is going to cut it with these two people. Jasper is honorable and tortured and Callie demonstrates how a woman can be strong and vulnerable at the same time in her situation. Because of Callie’s modifications, the military now has a claim to her as an agent, a fact which appalls Jasper who thought his bargain was any price the military wanted from him. Callie has a sense of how powerful she is now and part of her newfound outlook on life is that she wants no secrets between her and Jasper. While he still wants to protect her every chance she gets, she’s no longer a delicate flower to be protected, and she forces him to renegotiate their marriage with this in mind. I think what blew me away the most was the fantastic and very sinister world our hero and heroine live in. Technological adaptations have occurred which make this world a dirty one with people separated into have and have-nots regarding enjoying the benefits of scientific progress. The mysterious and menacing General Black, head of the spy ring for which Jasper and now Callie work, has a story arc within him that I’m eager to read more about. This couple is also not lacking in the hot and heavy department, adding a sexual heat to their marital power dynamics. A nice roster of secondary characters make this a series I will be reading, for sure. I have to give a major shoutout to the cover designers at Carina Press – I honestly think this was the best grouping of covers I’ve seen in a couple of years. Not only are they beautiful and rich looking, but the accurate level of detail (down to the appearance of the models or the small presence of key story features like the balloon that endangers Lia in This Winter Heart or the map of Australia and the kangaroo in Wanted: One Scoundrel) was astonishing. The cover of the anthology did not disappoint either, with the frosted design of the goggles and the bright red balloon clearly indicating the holiday with a bit of steampunk twist.